Let’s face it, smartphone speakers are horrible. With the exception of a select few devices from HTC, most smartphones nowadays do not have awesome speakers and unfortunately the majority of manufacturers still have not implemented front facing speakers in their mobile devices. We all know this situation, you are with a group of friends and want to listen to some music but the crappy speakers on your phones don’t do the files any justice. The usual solution is grabbing a portable speaker of sorts but in most cases they are out of reach. Well it seems that now there is a solution to the problem – AmpMe. 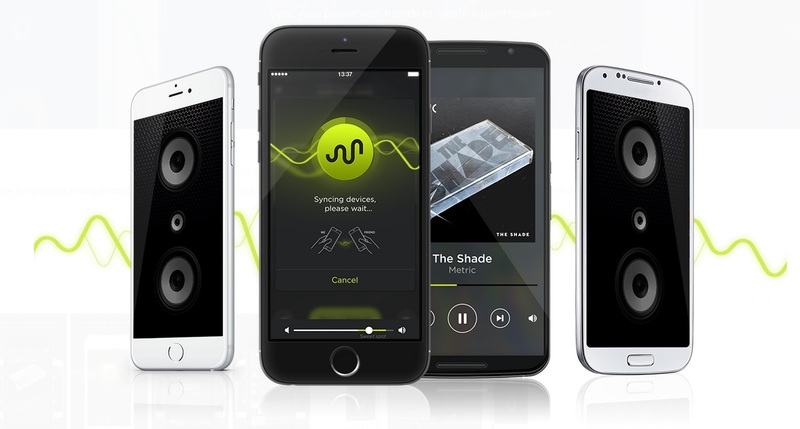 AmpMe is an application that lets you synchronize your music across any Android or iOS device and then play the song through whatever number of devices you choose to connect. What’s cool is that you can connect mobile devices and bluetooth speakers (those that have a microphone – only on Android for now) therefore allowing you to really crank up the tunes if enough devices are involved. The music itself is controlled by devices connected as “Hosts” whilst devices connected as “Speakers” can only control the volume. When connected, users can also easily answer phone calls. The app will stop music playback and resume after the call is over. AmpMe is also smart enough to resume playback on all connected devices so no need to pair once again. All this is possible through the exchange of “audio fingerprints” between devices. We have seen something similar to this from Samsung in the form of Group Play however that is only limited to Samsung smartphones hence the reason you do not hear about it often. As AmpMe is cross platform compatible, it has huge potential and will very likely become quite popular. AmpMe also has an application for the Apple Watch (no word on an Android Wear version yet) and is compatible with Soundcloud. AmpMe is working to get other streaming applications on board so if you are a big fan of Spotify or Pandora, you will have to wait. The best part about AmpMe is that it is completely free so all your friends (except those using Windows Phones of course) can get the app and get in on the musical experience. With simple mechanics and a developer team working to make the app even better, AmpMe is definitely an app you should try out and keep an eye out for in the future. Nexus 5x and Nexus 6P to be available for pre-order from 29th Sept.